Hello stamping friend. I hope that you’ve been enjoying my 12 Weeks of Christmas tutorials! What – you don’t know what I’m talking about?! If you don’t, that means you’re not a subscriber to my newsletter! No worries – you’ve only missed the first 4 weeks – there are 8 more weeks to go! Just sign up to receive my newsletter – it’s on the right hand sidebar, here on the front page of my blog. If you’re wondering why I’m asking for what country you live in – it’s so that if you’re in Canada, where I am, I can send you special product sales! As a Stampin’ Up! demonstrator, I can only sell product to you if you live within my country. Anyway – once you’ve signed up, next Wednesday you’ll receive week 5 of my 12 Weeks of Christmas tutorials. You get step-by-step instructions, including product lists, measurements and photos, all so you can create fun holiday projects! In case you’re doubtful, here’s a sample of the kind of tutorial you’ll receive. If you’ve already signed up – this is a BONUS for you! Use the Simply Scored Scoring Tool to score the 8 ½” x 5 ½” Whisper White cardstock at 4 ¼”. Fold on score line, and set aside. 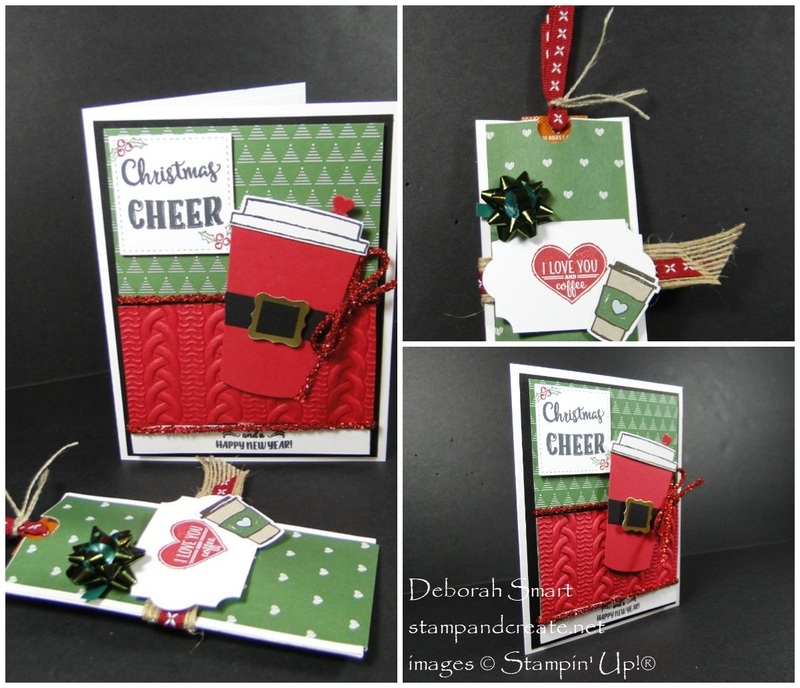 Place the words ‘Christmas’ and ‘Cheer’ from the Merry Cafe set on a Clear Block, with the Christmas above Merry. Stamp in Memento black ink onto the 2” x 2” Whisper White cardstock. 3. Use the Big Shot and Stitched Shapes square Framelit to die cut the sentiment. Stamp the berry image in Real Red ink in the top left and bottom right corners of the sentiment square. Next, stamp the holly leaves in Garden Green ink beside the berries; see photo for placement. Set aside. Stamp the lid image in Memento black ink onto the 2” x 1” piece of Whisper White, then die cut using the Big Shot and Coffee Cups Framelits. Use the Coffee Cups Framelits to die cut the cup shape and heart shaped ‘drip stopper’ from the 3 ¾” x 2” and scrap pieces of Real Red cardstock. Use a Stampin’ Spritzer filled with water to lightly spray the front & back of the 3” x 2” Real Red cardstock. 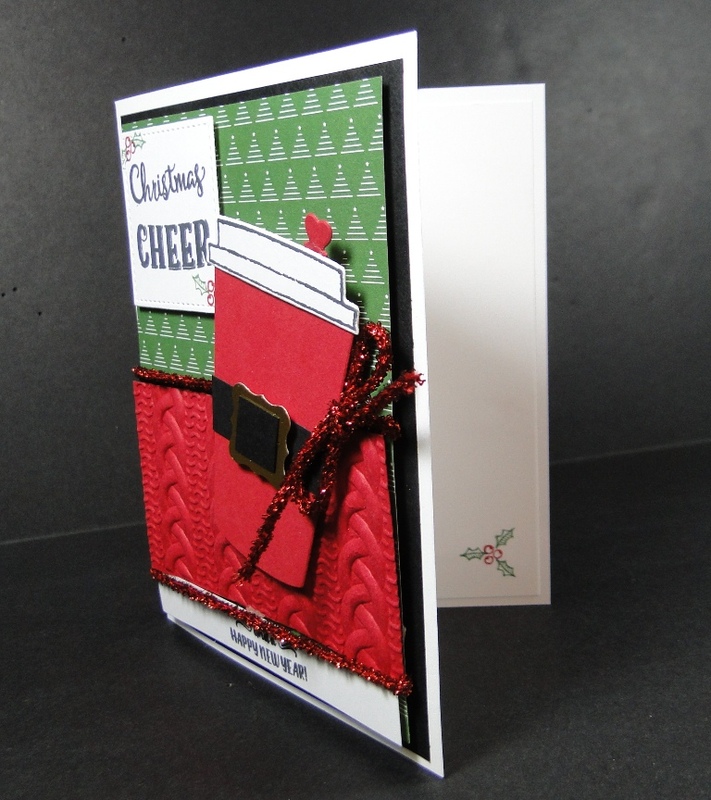 While it’s still damp, place the cardstock in the Cable Knit embossing folder, and run through the Big Shot. Stamp the ‘and Happy New Year’ sentiment in Memento black ink onto the 3 ¾” x ½” strip of Whisper White cardstock. Attach the 4” x 5 ¼” Basic Black cardstock to the white card base, using the liquid glue. Use Dimensionals to attach the stamped new year sentiment across the bottom of the 3 ¾” x 5” Be Merry DSP. Attach the embossed red cardstock above that. Assemble the cup, using Glue Dots to attach the lid to the cup, and the ‘drip stopper’ to the back of the lid. Use liquid glue to attach the black cardstock ‘belt’ (1 ¾” x ½”) to the middle of the cup shape; trim excess ends. Use a Dimensional to attach the gold part of the belt buck to the middle of the belt, then attach the black centre of the buckle using a piece of Tear & Tape. Before attaching the cup to the front panel, wrap a length of red Tinsel Trim across the width of the panel, immediately above and below the embossed panel. Tape ends of trim to back of panel. After attaching the cup and Stitched Shape square sentiment to the front panel with Dimensionals, tied a bow made with the red Tinsel Trim, and attach it with Glue Dots beside the cup; see picture for placement. Attach the 4” x 5 ¼” Whisper White cardstock to the inside of the card. Repeat the stamping of the holly berries and leaves in the upper left and lower right corners in red and green. Use Simply Scored to score the 2 ¼” x 9” white cardstock at 4 ½”, fold on score line. 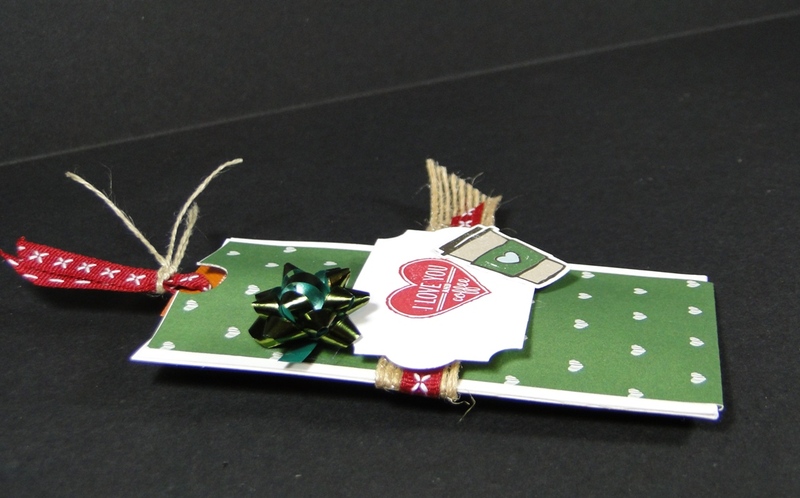 Attach the 2” x 9” Be Merry DSP (with the white hearts on green background pattern) to the above white cardstock, using the liquid glue. Use the ½” Circle Punch to punch a half circle from the top middle of the front of the pouch. Note – you want the front of the pouch to have the hearts facing the right way up! Place Tear & Tape along the inside, long sides of the pouch. Remove backing, and close pouch, rubbing along each side to ensure the tape holds. Stamp the sentiment in Real Red ink on the small piece of Whisper White cardstock. Use the Everyday Label Punch to punch it out. Use the mini coffee cup die from the Coffee Cups Framelits to die cut the small cup from the patterned piece of Coffee Break DSP. Wrap a length of Burlap ribbon around the middle of the pouch, attaching it with either liquid glue or Tear & Tape, leaving the ends free to one side. Then wrap a length of the stitched ribbon on top of that, in the middle; use Tear & Tape to hold it in place. See picture for placement. Use Dimensionals to attach the die cut cup to the sentiment label, then attach the label to the middle of the pouch, on top of the ribbons. Attach a green Mini Bow to the top left of the label. Use a small punch or piercing tool to create a hole at the top of the coffee pouch itself. Thread a piece of the stitched ribbon through the hole, and then tie it off with a piece of Linen Thread; see picture. I hope you enjoy this tutorial! The little coffee pouch is a perfect little ‘thank you’ gift for a hostess, or co-worker. You can order the supplies I used to create these projects by clicking on the images below. You’ll go straight to my online store, which is open 24/7, so you can shop whenever it’s convenient for you! Next Next post: Friends + Card Swaps = Fun! Super cute projects, Deborah. Love the colors too!